Case Photography offers a wide variety of beautifully crafted products that allow you to display your photography. All of our products are custom designed and made to display your photos for a lifetime! The California Engagement Session is something that we started offering several years back. It allows us to travel to anywhere in California for your engagement photos. California is such a beautiful state and it’s only right to take advantage of all these sites as often as possible. If you are beach lovers, let’s go to the coast or if you’re avid hikers, let’s go to the mountains. We offer this because we believe that the engagement session should reflect your relationship, and also be a fun adventure at the same time. We feel that this 2 hour session really gives you both a chance to connect with us, allowing you to be more comfortable in front of the camera on your wedding day. Case Photography’s custom wedding & engagement albums are made only of the absolute highest quality of materials available. These are meant to last a lifetime and that is why the pages are heavy to ensure durability. The pages are coated with a premium lustre finish, allowing your photos to come to life. The albums are professionally bound in a way that allows the entire photo to be visible even if it overlaps onto the next page. This characteristic allows your photos to be stretched across two pages for a more dramatic look. The covers are padded and include one of your favorite photos. The photo cover includes a premium leather back and spine which is nicely stitched to your cover which gives it a very impressive look! A Photo-wrapped case is about the size of an old CD box. It is essentially a box which is wrapped with a couple of your photos. Housed inside is a custom engraved USB flash drive which has your high resolution photo files transferred to it. All of our photo-wrapped cases, engagement albums, & wedding albums are professionally packaged for you to ensure a beautiful complete final product. These items are first wrapped with tissue paper, placed inside of your box, & the lid is held on with a cloth ribbon! We understand how exciting planning your wedding is. We also know how important it is to have all of your family and friends present to witness the union of you and your new spouse. 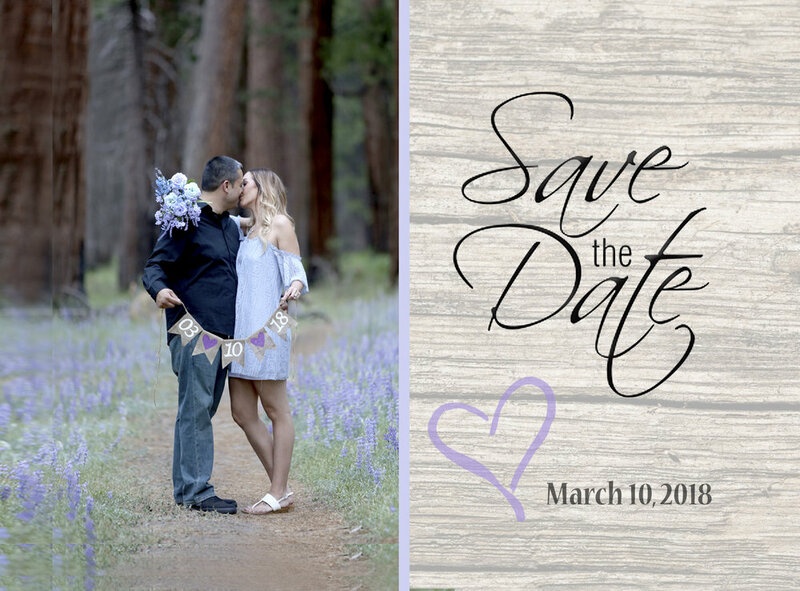 We offer Save the Date cards to get the word out to everyone who you want to save your date! It is always a very nice thing sending out cards to thank your guests for attending your wedding. Guests always enjoy receiving a Thank you card in the mail weeks after the wedding with one of your favorite wedding photos on it! The cards are usually formatted to a 4"x5" which is a great size for mailing. Our cards are designed custom to what you like and they are never printed before receiving your approval first! Our canvas prints are offered in a variety of sizes and proportions. Each canvas is tightly wrapped to perfection and truly showcases your photograph. *Other products are available upon request. Listed above are our most popular choices!